The iconic Scam School notebook. Scam School is "the only show dedicated to social engineering at the bar and on the street." 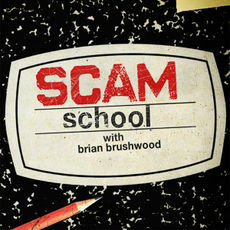 Hosted by Brian Brushwood, Scam School is a podcast which demonstrates entertaining tricks to its viewers, often for the purpose of scamming a free drink off of friends. It has become one of the definitive sources for young magicians to learn and develop their craft. Scam School is the longest running of Revision3's original slate of podcasts. The podcast premiered on Revision3 on April 6, 2008 with The Human Chimney. Two more episodes followed on the following two days with weekly episodes beginning on Thursday, April 10, 2008. Towards the end of 2012, Revision3 was bought by Discovery which brought Scam School under the blanket of Discovery Digital Networks distribution channel Testtube. During this shift production moved from San Fransisco, at the Rev3 offices, to Austin so that Brian could shoot locally. One year later production moved entirely in-house; every episode since 302 have been a Bizarre Magic, Inc. production. Brian, or a magician guest, establishes and demonstrates a magic effect to participants in a bar, then after a sponsor break the participants are taught how the effect was achieved. Each episode is approximately 10 minutes in duration; new episodes publish every Wednesday. This page was last modified on 26 December 2016, at 02:04. This page has been accessed 20,992 times.